Thanks for all the amazing submissions! 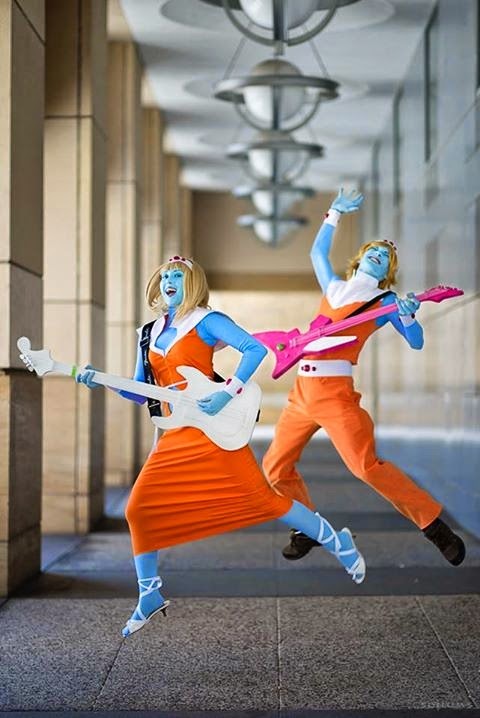 1st Place - Amanda is dressed as Stella from the animated music video by Daft Punk called Interstella 5555! She is wearing our Sky Blue turtleneck bodysuit and Sky Blue thigh high stockings! 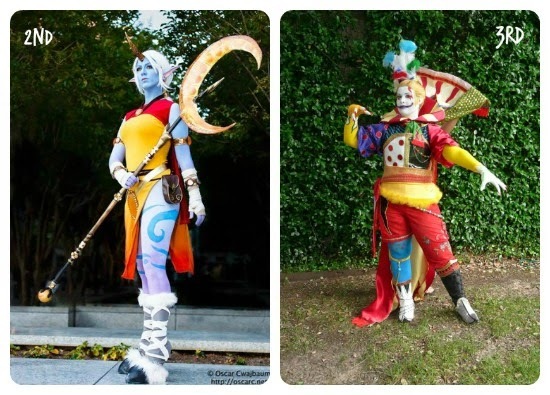 2nd Place - Michelle is Soraka from League of Legends. 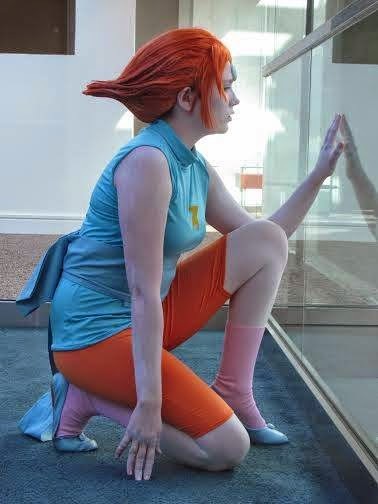 Michelle in her own words explains how she made this costume: "two pair of Microfiber Nylon/Lycra tights in Sky Blue. I am wearing one pair on my legs, and one on my arms. To make the sleeves I cut a triangle out of the center crotch seam. That then became the neckline and the legs became sleeves I then sewed finger holes in the feet to make them gloves. After that dyed the tights in a ombre effect with Purple Rit Dye. For my legs, I painted the swirls on with fabric paint. I REALLY hate body paint so I thought this would be the best way to make a even looking body paint, and just used matching body paint to get my face. For my wig I'm using a Arda Inigo in Pure White (F18) and 3 packs of Long White wig wefts in Pure White from Arda as well.."
3rd Place - Becky is Kefka from Final Fantasy VI. Becky says, "I'm using one of a pair of solid color nylon microfiber gloves in Gold on my right hand, (trimmed & hemmed to be fingerless) as well as a pair of microfiber nylon tights in Yellow on my arms.The wig is an Arda! It's "The Dude" in light blonde"
1st Place - Josephine in leotard, tights, gloves, and socks from We Love Colors to make her Lego Movie Unikitty costume! 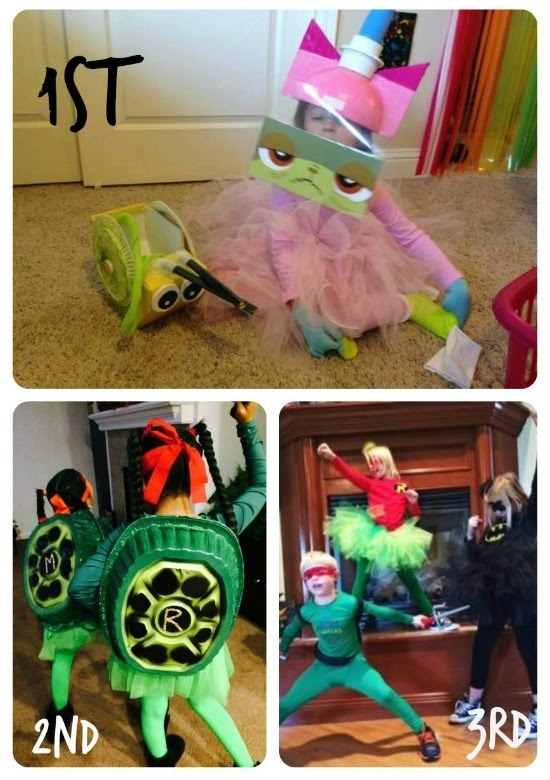 2nd Place - Yolanda sent us pics of her two little Teenage Mutant Ninja Turtles wearing We Love Colors Neon Green leggings. Turtle Power! 3rd Place - Aubrey and her band of super heroes! Aubrey is Robin wearing our Kelly green microfiber footless tights. We love your energy guys! Email us at halloween@welovecolors.com to collect your prize. Congratulations everyone! !